Rev is a popular transcription service. According to their website, they've partnered with quite a few big name companies over the years – Disney, The New York Times, and Viacom are listed, along with several others. Rev relies on work at home freelancers to handle most of their day-to-day workload, and they hire new people regularly. Today, we've put together a Rev review explaining how you can work at home for them! The jobs listed for freelancers at Rev are: transcription, captioning, subtitling, and translating. From what I've been able to learn, all the positions are fairly similar. The basic work rhythm is to log in, claim an audio file from a pool of available tasks, and transcribe it. Obviously, with a job like translation, there would be a few additional elements involved, and there are probably notation rules (or something along those lines) that differentiates captioning from ordinary transcription, but all the tasks seem to be roughly the same kind of process, at least in a general sense. Once you claim a file, you have an hour to change your mind and throw it back into the pool. After that, you're committed to finishing it, which is an important thing to keep in mind because, based on worker comments I found during my research, it might be better to give up on orders that seem too difficult. Rev apparently has fairly strict policies when it comes to quality control, and you'll need to do a good job every time you transcribe something. Otherwise, you might not keep your job for very long. Rev pays weekly via Paypal, which is one of the company's better features. Salaries will vary depending on your level of skill and which sort of job you're hired to do. According to the website, transcriptionists make about $245 a month on average, and subtitlers make approximately $958 per month. They don't list the pay rates for captioners or translators. So this is probably something to consider for extra money rather than giving up your day job to do it. For comparison, I also looked at the Rev salary information on Glassdoor.com, just to see how it matches up with the claims on the website. The Glassdoor data was a little more specific and gave me a better sense for how it all works. Apparently, transcriptionists make about $9 an hour, and captioners make anywhere from $3 to $8 per hour. Again, not very much. I spent a little time reading through user comments and was able to determine that the actual pay rate for transcription is apparently $0.50 for each minute of audio transcribed, which sounds really good at first glance. But it can take a lot longer than you might realize to transcribe a minute of audio, especially if you're dealing with difficult accents or several people talking at once. There's often a lot of rewinding and listening to the same little snippet, again and again, to figure out what's going on. So basically, it comes down to skill. Some people are really, really good at transcription, and they'll get a lot more money per hour than people who aren't thanks to their speed and comfort level. It's the sort of thing you'll have to practice for a while, and see how you can improve. It doesn't look like there are any requirements at all for transcribers and captioners, other than having a good grasp of English. They'll make you pass a test during the application process, but you don't need any experience. It sounds like they're pretty quick to hire people and at least give them a chance, which is good. Translators and subtitlers will need some ability to speak multiple languages, obviously, and the application form reflects that. But even there (unless I'm missing something) it doesn't sound like you'll need a college education to get hired. You just need to know two languages well enough to do professional quality translation. The form has a question about your past experience, but there is no mention of an actual requirement. Rev transcription is a very flexible job. You can work as many (or as few) hours as you want, whenever you want, provided there is work available to do. There's no minimum work requirement. I used Glassdoor to find opinions on Rev from former employees. At first glance, I thought the reviews looked great, but when it comes to feedback, Rev is kind of a tale of two companies. On the one hand, you have the opinions of people who actually work on-site at the official headquarters. Those folks seem to love their jobs, and give consistently high scores, which is why Rev's overall rating on Glassdoor is 4.5. With freelancers, on the other hand, it's a whole different kettle of fish. If you filter out the noise, and just look at reviews with the word “transcriber” in them, for example, the score goes all the way down to 2.5. The reasons for the lower scores are pretty extensive. The biggest complaints seem to be low pay and a high level of difficulty for a lot of the files available to transcribe. A number of workers talked about having to deal with heavily accented English and trying to make sense of conversations involving three or four people talking over each other. Some transcribers felt like the company should pay more for files that were obviously much more difficult to deal with. Another frequent complaint was the company's heavy-handed, unforgiving management style. Several reviewers talked about getting let go for very small mistakes, and often without receiving a warning of any kind or getting an opportunity to improve their performance. Fortunately, the feedback wasn't all bad. There were also quite a few positive aspects mentioned, even from people who had an overall negative feeling about the job. 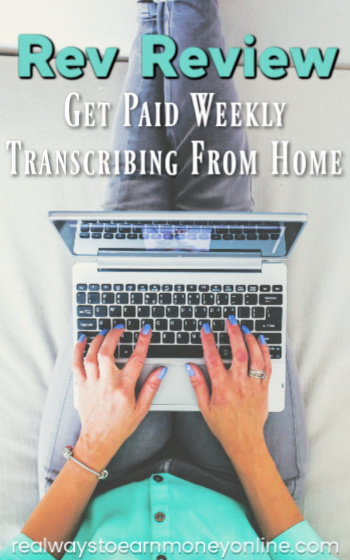 Most transcribers seem to love getting paid on a weekly basis, as well as the freedom to work whatever hours suit them. Overall, you'll have to weigh the pros and cons for yourself and decide whether or not this job matches your work-style. Despite all the problems, I can definitely see why this might be a good gig for certain people. If you're looking for a transcription company that pays weekly and will keep you fairly busy, then this might be for you, as long as you can tolerate the lower salary and stay out of trouble with management. If work-at-home transcription is a field you'd like to explore, and Rev seems like the sort of company you could do well with, go here to read more about the positions available, and put in your application. Good luck! Jumpstart Your General Transcription Career – the most informative transcription eBook you'll find, written by transcriptionist and fellow work at home blogger Lisa Mills. I had a similar experience working for Rev as Liz & Jen. There are very few files to transcribe with clear audio, spoken in American accents. Almost everything is terrible quality with difficult to understand accents. This causes you to have to listen to the same parts over and over again, making it so you’re earning almost nothing doing this. I am hopeful that there are better transcription opportunities out there than Rev. Thank you for your comments Liz and Jen. You just saved me a ton of time exploring a sounds too good to be true work at home job. There are quite a few drawbacks to working for rev.com and it’s important to understand them before you sign up and potentially waste a bunch of time. It’s generally accepted that $1 per audio minute is a decent rate of pay in transcription. As I mentioned above, rev.com jobs usually ring in around $0.45 per minute. Definitely not great by industry standards. I’ve read that the pay at rev used to be much better and has been lowered over time. You will find several rev.com reviews around the internet that pan them for their ever-declining pay rates. If there’s no work available, you can’t make any money. I have found that there’s consistently 30-50 jobs in the queue at any given time up until now. This morning I checked and there were zero jobs available. I guess that’s bound to happen as demand ebbs and flows. Some of the audio files on rev are straight-up crap. There are definitely some good jobs available but the majority of the high-quality audio files seem to go to the revver+ folks. I have found that there’s a huge range here from decent through to completely unusable. Fortunately, you can see how many times a given job has been ‘unclaimed’. This is when a revver claims the job and then decides against completing it. More than 3 unclaims is a sign that the file is probably quite difficult to transcribe. There are multiple instances on Reddit and other forums of revvers having their accounts closed for no apparent reason. The stated reason will be that your metrics have fallen below their standards, though several folks have posted screenshots proving this false. To me, this is the biggest concern. I wouldn’t want to invest the time getting good at transcription and getting used to rev’s system just to arbitrarily have my account closed. I still think rev.com is worth your time if you’re just getting into transcription, but you should consider using it as a stepping-stone to hone your skills while you hunt for other, more lucrative opportunities. Way to low of pay for the files they give you! Hard to understand accents and poor quality. I really wanted to love Rev and was quickly “promoted” my first week. Then I got the “left over” files that no one wanted. It was horrible. Low pay and high stress. Not worth your time. Transcription is not the career to get into IMHO. I type 85 to 113 WPM depending on the content and I have transcription experience. For my first long project at Rev, I earned $2.46 an hour. I took me about 10.5 hours to transcribe a 1-hour recording of a market researcher interviewing a Jamaican man with a Ph.D whose accent got heavier and heavier as time went on, and who never spoke in a complete sentence. Note, you are not allowed to edit. When I checked reviews on Indeed, I found that some people earned as little as $.90 an hour. Almost all the projects that beginners have access to are projects that are rejected by the upper 2 tiers of more experienced transcribers. And almost every project involves poor quality audio or heavy accents. I can make more collecting aluminum cans on the road or crocheting dishcloths than I can doing transcription at Rev.